If you’re not aware, we have just passed a point where there are more Internet searches done on smartphones than on computers. Quite simply, a phone is not really a phone anymore–it’s a web device. And with more and more people getting 4G service on their phones, they are finding that their phones can search the Internet as fast or faster than the broadband they may have at home. This has several implications, the first being that businesses are tailoring their websites for mobile phone layout. Generally, your website provider has built a website that at least knows that it is being shown on a mobile device, and does some reformatting. But now your mobile site is being compared with businesses who have totally revised their format and have a dedicated version of their website specifically for mobile devices. In other words, you’re suffering by comparison if you’re not up to date. Often your web designer will tell you that your website is “optimized” for mobile devices, and that may be true, but it may also mean that all they really did was shrink it. This forces people to have to slide it in all different directions and stretch it to read the text. This is no longer acceptable. 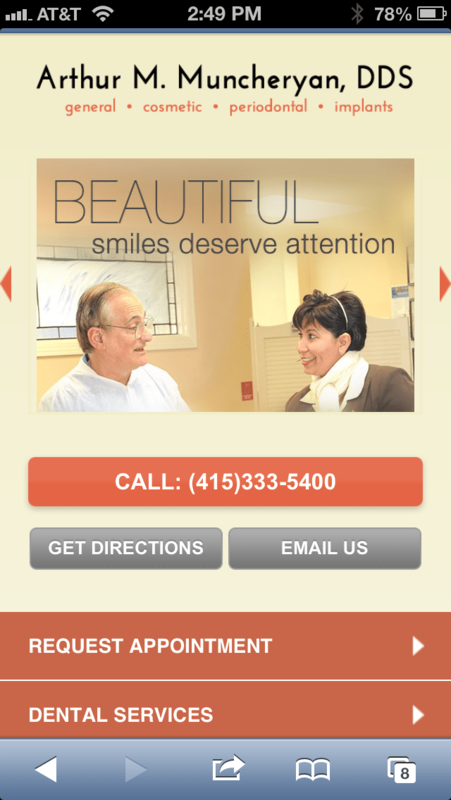 Your website needs a dedicated mobile version, which completely rethinks what is presented and how people use the site. So what should it be? First, it should have a very simple face page. They should see your logo, a nice image, a button to touch to call your practice, a button for directions and a button to request an appointment. And not much else. Second, it should only scroll up and down, never needing to be moved from side to side. Third, it should be easily readable without stretching. Fourth, limit the content, and put easy buttons that open new pages that explain your various services. The more involved aspects of your website should be deeper, or left out for viewers to find on a computer at another time. It’s easy to get to overkill on mobile content. A new and very big change is that Google announced that they are going to be factoring in the speed at which your mobile website loads as part of your overall SEO. So you could have a great website, with good content that changes often, and if your website is not in a dedicated format and chugs along trying to load for 30-45 seconds, you will lose a lot in your ranking. Take a look now at how your website looks on a mobile phone, and watch how long it takes to load in a 3G environment. If it doesn’t meet the above criteria, you need a new webmaster, or you need your webmaster to build you the appropriate mobile site. This is not something you should wait on, as your website is the cornerstone of all your marketing at this point in time. WebDirector builds websites that automatically include a dedicated mobile site like the one above, and other companies do as well. For more thoughts on what your website needs to be now to make Google and consumers happy, click to my previous blog on the subject here. This entry was posted in Advertising, Dental Marketing, Dentistry, Uncategorized, Websites and tagged advertising, dental marketing, dental practice marketing, dentistry, Google, websites by Fred Joyal. Bookmark the permalink.